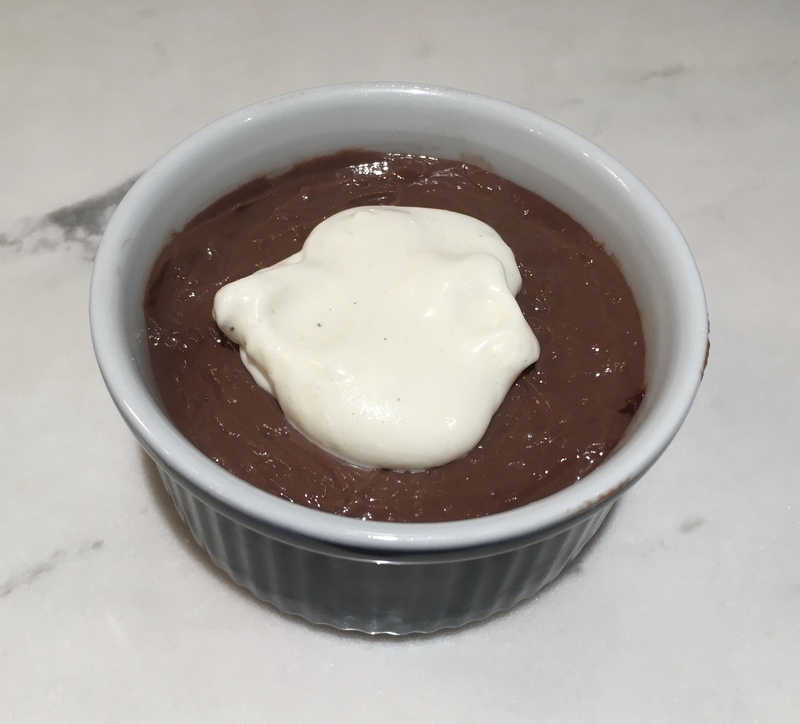 Chocolate pudding is a comforting dessert yet sophisticated enough to be served for a holiday party. This recipe is popular with adults and children and accommodates those who are gluten-free. It sets up soft and creamy. I prefer a rich dark cocoa powder for the pudding. The brand I use most often is Cacao Barry Cocoa Powder 100% Cocoa Extra Brute. In a 2-quart saucepan combine milk, cream, 1 cup of the sugar, and a pinch of salt. Whisk to blend well. Turn heat to medium low and warm the mixture. In a separate bowl combine the remaining 1/4 cup sugar with cocoa powder and cornstarch. Mix well. Mix the egg into the cornstarch mixture, then whisk in 1 cup of the warmed milk and cream. Whisk constantly to smooth the cocoa mixture, then add it to the saucepan with the warmed milk. Use a wooden spoon to stir constantly until it has thickened into a pudding. It should take about 7-10 minutes to thicken. Remove from heat and strain the pudding into a clean bowl. Whisk in vanilla and butter, then continue whisking until butter melts. Cover pudding directly with plastic wrap and chill until cold. Top with sweetened whipped cream to serve. Makes enough for 4 servings. This is my favorite recipe for scallops. I could eat the entire bowl by myself. I have used both small and large scallops for this dish and I prefer larger scallops since the smaller ones can sometimes overcook quickly. If you cook fish and seafood for the Christmas holidays, I recommend you try this recipe, which I adapted slightly from one my cousin James gave us. Merry Christmas. Begin by rinsing the scallops then drying them with paper towels. Sprinkle scallops with salt and pepper and a very light sprinkling of garlic powder. In a 2-cup glass measuring cup combine olive oil, wine, garlic, oregano, salt, and both peppers. Whisk to mix well. Place scallops in a deep bowl and pour the olive oil mixture over the scallops. Let marinate 15-20 minutes. While the scallops are marinating, fill a 6-quart stockpot with water. Bring to a boil on high heat, then add 1 teaspoon kosher salt and return to the boil. Add linguine and cook until al dente. 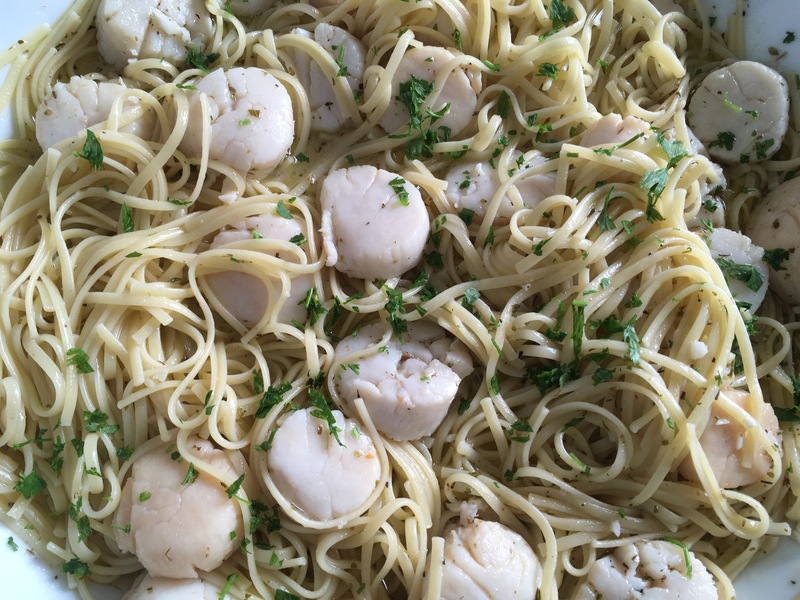 While pasta is cooking, place scallops and marinade in a large frying pan on medium-low heat. Bring to a simmer, cover, and let scallops cook about 4 minutes, then turn scallops and cook another 3-4 minutes until they are white and cooked through. Check for salt and add as needed. Reserve 1/4 cup of the pasta cooking water, then drain pasta. Add reserved pasta water to the scallops. Let cook 1 minute or so. Pour pasta into a serving bowl, then pour scallops and olive oil mixture over pasta and toss. It will seem soupy but some of the liquid wll absorb into the pasta. Garnish with chopped parsley. Serves 4. It would not be Christmas in our house without some homemade biscotti. This year I have been experimenting with a gingerbread version. While it may not be traditional, my family loved them and I did, too, because I was able to enjoy the flavor of a good gingerbread cookie without having the time-consuming task of baking a cut-out cookie with its chilling, rolling, cutting dough, and decorating. 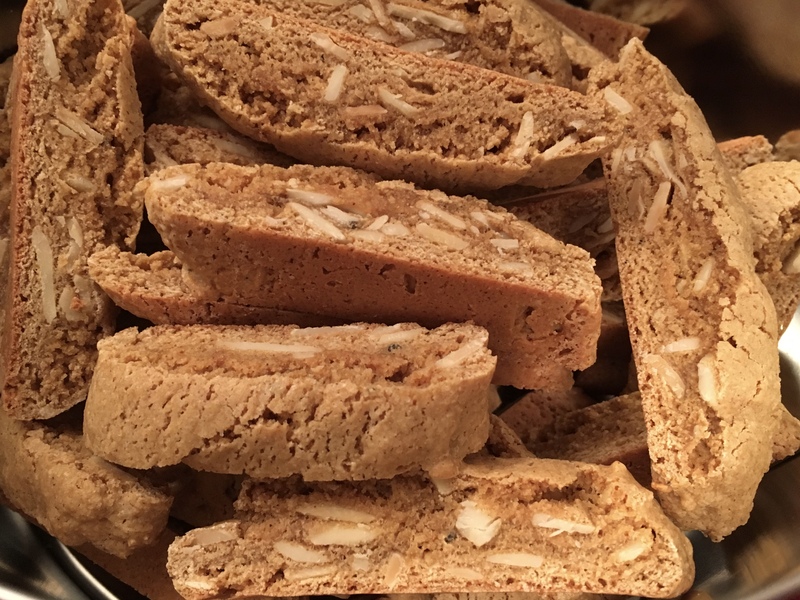 My favorite biscotti recipe is from pastry chef Emily Luchetti, which I adapted for this gingerbread variation. The dough is quite sticky, so be sure to lightly flour your hands when forming the three logs. This will yield about 60 small biscotti. If you prefer large biscotti, make only two logs. Preheat oven to 325 degrees. Line a baking sheet with parchment paper. In a medium size bowl combine flour, sugars, baking powder, salt, and spices. Mix well, breaking up any clumps of brown sugar. In a separate mixing bowl beat eggs until well mixed. Add molasses and vanilla to the eggs. Slowly add the dry ingredients. Scrape down the sides and bottom of the bowl. Once the dough is well mixed add the nuts. The dough will be thick like peanut butter and sticky. Flour hands, then divide dough into three portions. Form three logs on the parchment-lined sheet pan. Bake for 25 minutes until puffed and set, rotating pan halfway through baking. Remove pan from oven and set baking sheet on a rack to cool for 5 minutes. Transfer cookie logs to a cutting board and slice on the diagonal. You will get roughly 20 biscotti per log. Return sliced biscotti to the baking pan. (You will need a second baking sheet to fit all the sliced biscotti.) Bake for 5 minutes. Turn cookies over and bake 5 more minutes to dry slightly. Cool on rack. Store in a tin or freeze. Makes 60 biscotti. I was introduced to ma’amoul many years ago in Manhattan and have loved them ever since. Many recipes call for semolina in the dough but I prefer a shortbread base made with flour and butter because it produces a more tender cookie. They can be filled with a date paste or nuts. My favorite filling is pistachio with orange flower water. Years ago, I was in Boston with a friend and we stopped at a Middle Eastern market for some spices. We saw a basket full of fun looking wooden molds but we had no idea what they were for. We each bought one anyway because we liked to collect kitchen gadgets. 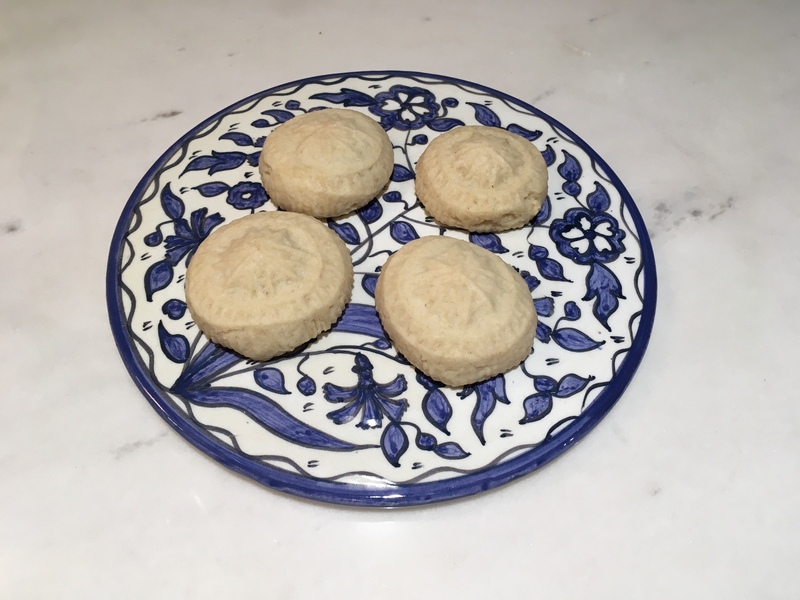 Some time later, I discovered that the mold was for making ma’amoul and I was very glad I had purchased one. If you do not have a Middle Eastern grocer near you, Amazon.com sells the molds. You can also form the cookies by hand and avoid the mold all together. I’ve given instructions for both methods below. The dough is easy to work with and does not require chilling. The last time we made these cookies we made several batches at once and ran out of pistachio filling but still had dough. We decided to try filling the remaining dough with Nutella. Ma’amoul with Nutella filling is probably a bit unconventional but surprisingly complementary with the orange flower water. I began thinking of other possible fillings such as custard, lemon curd, caramel, or thick jams. This recipe is adapted from Claudia Roden’s wonderful tome The Book of Jewish Food: An Odyssey from Samarkand to New York. To make the dough combine flour, sugar, and salt in a food processor bowl. Pulse to mix. Add diced butter and pulse to get a crumbly mixture. Add orange flower water and milk, then pulse until the dough comes together. You do not want a crumbly dough; it should come together and not be sticky. Turn dough out onto the counter and knead lightly to make it smooth. Clean and dry the food processor bowl so you can use it to make the filling. Combine pistachios and 1/3 cup of sugar in the food processor bowl. Pulse to grind the pistachios somewhat fine but not into a powder. Add salt and spices. Pulse again to mix. Add orange flower water and pulse to mix. The nuts should be fine ground and the mixture moist. Preheat oven to 325 degrees. Line two baking sheets with parchment. To form the cookies by hand: Take a walnut size piece of dough (1 oz.) and roll it into a ball. Make a well in the center of the dough and fill it with roughly two teaspoons of the pistachio filling. Spread the filling and flatten slightly. Bring the dough around the filling to seal up the dough completely around the pistachios. You want a dome-shaped cookie. Place cookie on baking sheet, flatten the top slightly, then poke the top of the cookie with the tines of a fork for a design. 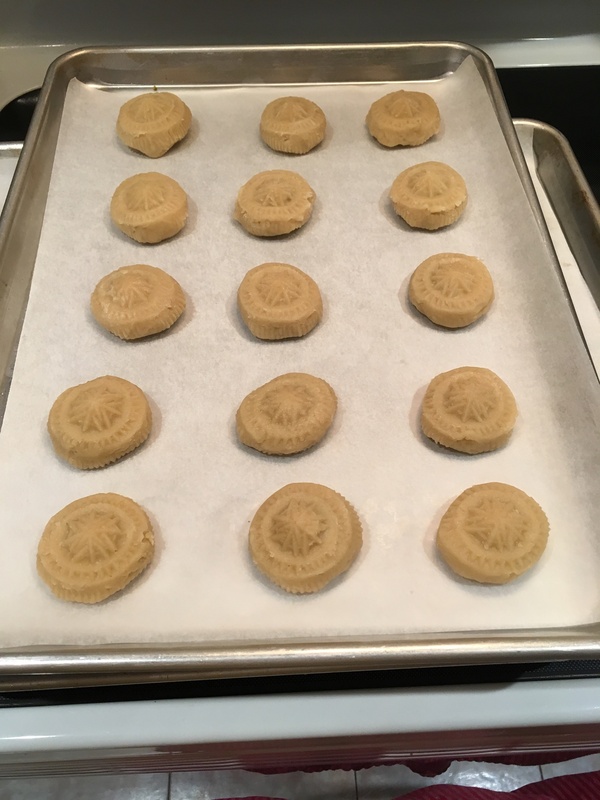 To form the cookies with a ma’amoul mold: Use a pastry brush dipped in canola oil and brush the mold to keep the dough from sticking. You should brush the mold lightly with oil after every three cookies or so. 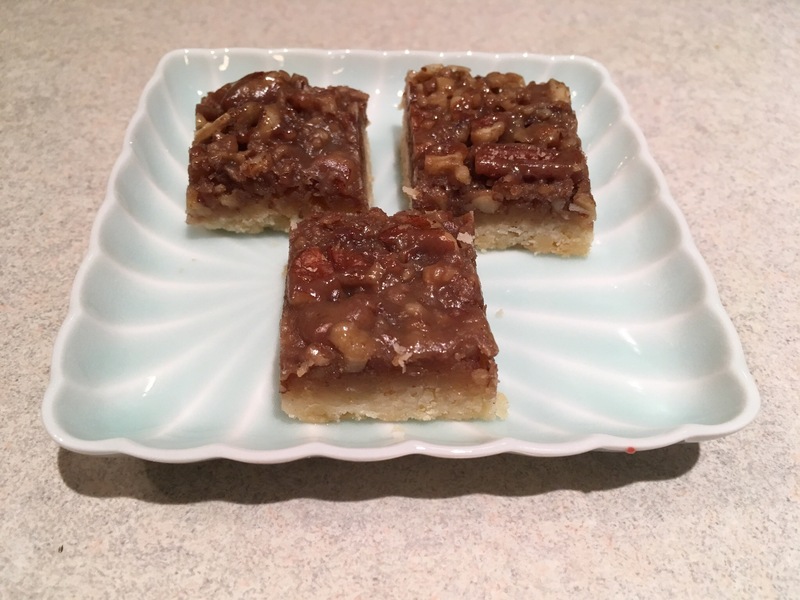 Take a walnut size piece of dough (1 oz.) and pat it into the mold. You want the dough to come up to the top of the carved edge. Place two teaspoons of pistachio filling into the center and flatten the filling slightly to spread it towards the edges. Fold the dough over the filling so it is completely covered. Tap the mold rather forcefully on the counter with your hand beneath it to catch the cookie as it releases from the mold. (If some of the dough sticks into the grooves of the mold, use a toothpick to remove the dough and brush the mold with oil.) Place on cookie sheet, about 15 cookies per sheet. Bake for 20 minutes, rotating the pan halfway through baking. The cookie should be fairly firm to the touch, pale on top, and golden on the bottom. Do not brown the cookies. Remove from oven and cool ma’amoul on a rack. Store in an airtight container or freeze. It is optional to dust the cookies with confectioners sugar before serving. Makes 25-30 cookies. If you need an easy and delicious dessert to take to a holiday party, make this Panna Cotta. It only takes a few minutes to put together. Make it the night before you intend to serve it since the flavor improves as it sits. In a small bowl whisk together cold water and powdered gelatin. Let sit for 5 minutes. In a 2-quart saucepan whisk together eggnog, cream, milk, sugar, salt, vanilla, nutmeg, and rum extract. Once the mixture is smooth, turn the heat to medium low and, whisking often, heat the mixture until hot and smoking but not boiling. It should take 5-7 minutes. Remove from heat and whisk in gelatin mixture. Whisk until gelatin has melted. Pour into 3-cup serving bowl or individual ramekins. I use small 1/3-cup ramekins since it is a rich dessert. Chill uncovered for 4 hours, then cover with plastic wrap. Serves 8 if using small ramekins or 4 if using larger ones. Pignoli cookies are some of my husband’s favorite cookies. We buy them at Italian pastry shops whenever we are on the East Coast, but I wanted to learn to make them at home. There are many variations on this cookie depending on whether you want them a little more cake like or more crisp on the outside and soft, chewy and airy on the inside. This recipe is a variation on one made by mother’s childhood friend in New Jersey. I like to make the cookies on the smaller side because they are rich. I get 60 cookies out of a batch when rolling them into marble size balls. You will get fewer cookies if you want them bigger. You can serve the cookies sprinkled with confectioners sugar but for the photo I left them plain so you can see the color you are looking for when baking them. 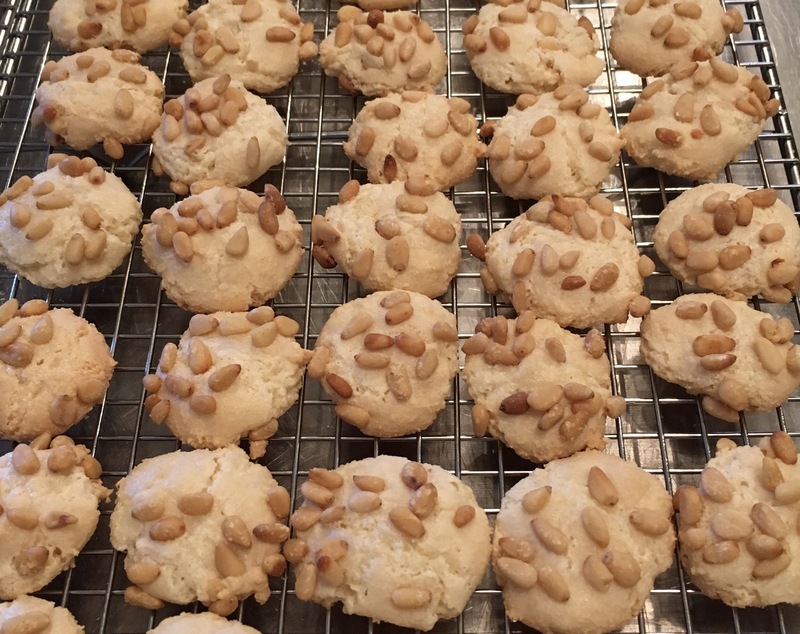 If you are unable to find reasonably priced pine nuts, you can top the cookies with sliced almonds. The cookies will keep just a few days at room temperature but they freeze well between layers of parchment paper. You can defrost them as needed. Preheat oven to 300 degrees. Line 3 half-sheet baking pans with parchment paper. Begin by breaking up the almond paste into small pieces and putting it in a food processor bowl. Add to the almond paste half of the granulated sugar, flour, a pinch of salt and almond extract to taste. Pulse until you get a granulated mixture with no almond paste lumps. Transfer the almond paste mixture to a separate bowl. Place egg whites and remaining sugar in the food processor bowl and process until whites are foamy. Then return the almond paste mixture to the food processor and process until the mixture comes together. Place pine nuts in a bowl. Very lightly flour your hands and roll almond paste mixture into marble size balls. Dip dough lightly into the pine nuts and coat one side only. Place pine nut studded cookie dough on baking sheet with nuts facing up. Lightly flour your hands as you continue rolling dough into balls. You can put 24 cookies on each baking sheet. Bake at 300 degrees for 15 minutes then rotate the pan and continue baking 10 more minutes until the cookies are light golden and have spread slightly. Transfer baking sheet to a rack and let the cookies rest on the baking sheet for 1-2 minutes. Then transfer cookies to a rack to cool completely. Sprinkle with confectioners sugar just before serving. Makes 5 dozen cookies. 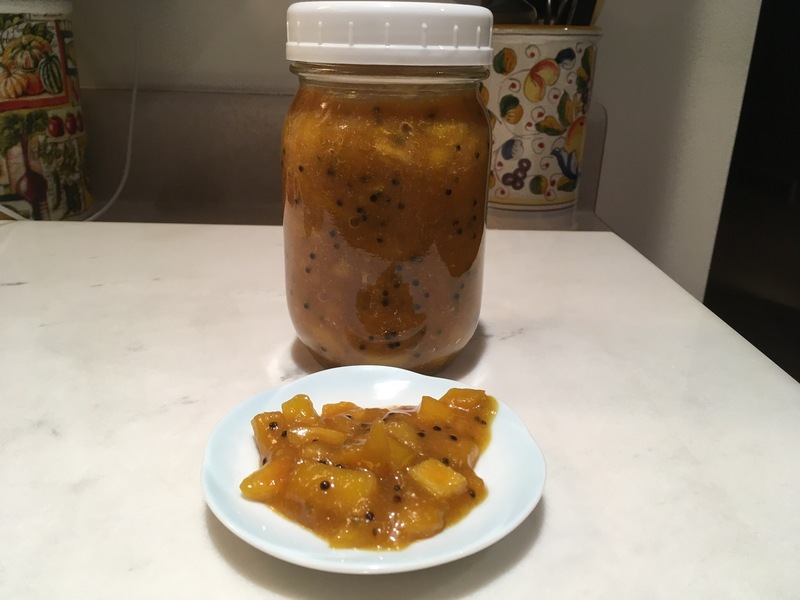 I was recently introduced to Indian lemon chutney by my cooking teacher Farida. I had never had it before and fell in love with its sweet and sour flavor. It is almost a lemon jam and quite addictive. Be sure to use thin-skinned lemons. As you cook the chutney it will seem excessively bitter and the peel will be a bit chewy. Let the chutney age in the refrigerator for about 3-4 weeks before consuming. The lemon peel will soften, sweeten and becomes less pungent. It would make a nice savory homemade Christmas gift for neighbors and friends. Serve it alongside chicken, fish, potato, or bean dishes. It is very good with eggs and green vegetables, too. Scrub lemons and slice stem end off slightly but not enough to expose the pulp. Place whole lemons in a 4-quart pot. Cover fruit with cold water. Place a lid on the pot and bring to a boil over medium high heat. Lower the heat to medium low, partially cover and simmer until the lemon peel has softened but is not mushy and falling apart. It should take 15-20 minutes, depending on the size and thickness of the lemons. Use a slotted spoon to gently remove the lemons onto a cutting board. Be careful that the lemons do not burst when you remove them from the pot. Do not prick with a fork to check for doneness. Let the lemons cool for 5-10 minutes or until they are cool enough to handle. Slice lemons in half lengthwise, then each half into four lengthwise slices so you have 8 long slices. Remove the seeds and some of the white membrane, then dice the lemon slices, both peel and pulp, into small bite-size pieces. You should have roughly 2-1/2 cups of chopped lemon. Pour canola oil into 2-quart saucepan. Turn the burner on to medium heat. When oil is hot but not smoking add mustard seeds to the oil. Cover quickly and shake the pan and heat just until the mustard seeds begin to pop and have become fragrant. This should only take 20 seconds or so. Be careful not to burn them. Immediately add the diced lemon and pulp to the mustard seeds and stir to mix. Add salt, cayenne, turmeric, brown sugar, and 1/3 cup water. Mix well. 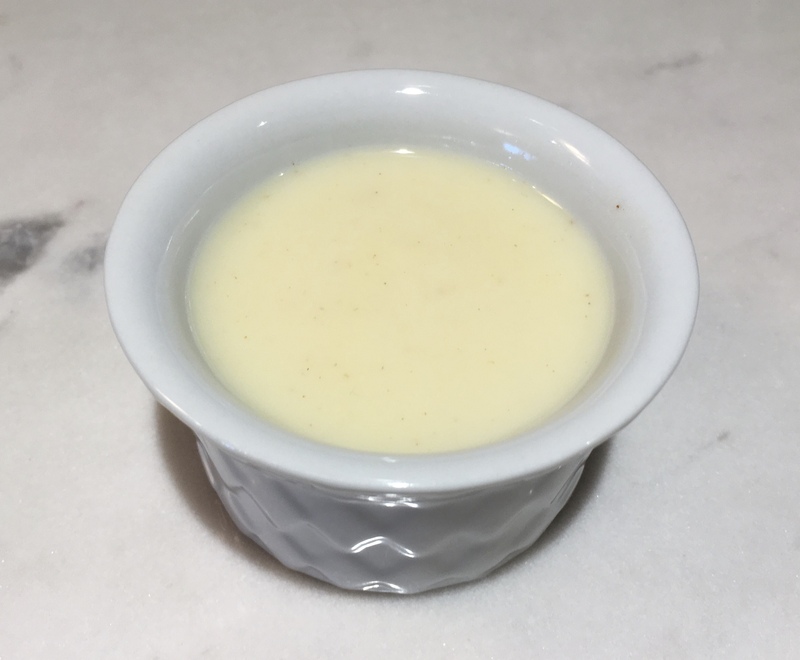 Turn heat to medium low, bring to a boil, then simmer the lemon mixture for 15-20 minutes, stirring often until the mixture has darkened slightly, the liquid has turned into a slightly thicker syrup, and you have a very loose jam. You do not want to cook it too long since it will thicken as it cools. Pour into jars. Screw the lids on and keep it in the refrigerator. The lemon peel will continue to soften and sweeten as it sits in the refrigerator, so wait about 3-4 weeks for it to age before consuming. It will keep in the refrigerator for at least two months. Makes 2-1/2 cups. Butterscotch-flavored treats were one of my childhood loves. They mostly came in the form of hard candies and instant jello pudding. As an adult, I tend to stay away from artificially-flavored butterscotch, since I prefer the real flavor that comes from brown sugar and butter. The past few years I’ve been trying different recipes for butterscotch pudding, but it isn’t easy to find a good balance. This recipe, adapted from Jean Anderson’s wonderful book Crisps, Cobblers, Custards & Creams, seems to hit all the right notes for me. It’s a lovely cold weather comfort dessert. 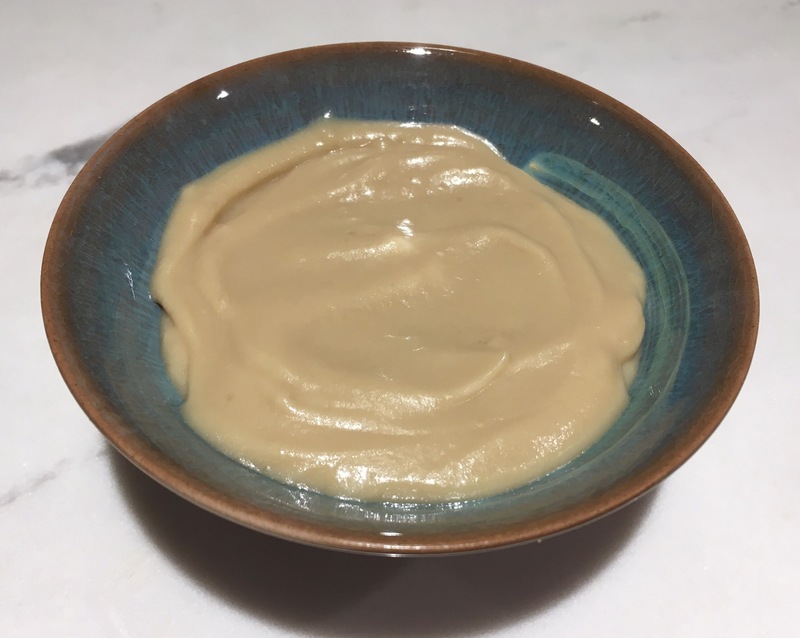 You can eat a bowl of it on its own, use it as a pie filling, or, if you reduce the cornstarch to 1/4 cup, it becomes a light butterscotch drinking custard that would work well drizzled over poached fruit or warm apple pie. It can be incorporated into layered desserts such as trifle with caramel and cream, and would be an easy yet elegant dessert for Thanksgiving or a holiday party. In a 4-quart saucepan combine milk, cream, brown sugar, cornstarch, and salt. Whisk well to combine. Whisk in egg yolks and beat until smooth. Turn the heat to medium low. Cook, whisking often for about 10 minutes or until the mixture begins to boil. Whisk constantly at this point until the pudding has thickened. You will need to cook it about 2 minutes after it boils. Remove from the heat and whisk in butter, mixing until the butter melts and is fully incorporated. Strain pudding, then add vanilla extract and whisk until smooth. Pour into a serving bowl. Cover with plastic directly on the pudding surface. Chill overnight until cold. Serves 4. My husband had a birthday this month and as part of his birthday celebration I made him one of his favorite pastries, rolled baklava. The original recipe came from my cousin Connie who acquired it from a Greek coworker in New Jersey about 50 years ago. I’ve modified it somewhat. One of my favorite Greek cookbooks is The Complete Book of Greek Cooking: The Recipe Club of Saint Paul’s Greek Orthodox Cathedral. I came across an intriguing baklava recipe in the book which used zwieback biscuits in the filling. There is also a baklava recipe on the Food52 website that calls for graham crackers. I decided to give the graham cracker version a try and really liked the results. Allow about two hours to prepare the rolled baklava. They are a nice addition to a holiday dessert platter. The flavor improves as they age. Preheat oven to 350 degrees and line 3 half-sheet baking pans with parchment. Prepare your work surface (I like to use a large silpat mat to work on). Take 1 packet of filo out of the box and let it come to room temperature on your work surface while you are preparing the filling and syrup. Have the melted butter ready. Make the filling by combining all the ingredients in the food processor. Pulse until the filling is the consistency of slightly coarse breadcrumbs. Transfer to a bowl and set out on your work surface. Combine the syrup ingredients in a 4-quart pot and whisk to mix well. Set it on the burner but do not turn on the burner yet. Open the filo dough packet and lay it open flat. Place a slightly damp tea towel over the filo to keep it moist. Take one sheet of filo and lay it down horizontally on the silpat or work surface. Brush it with melted butter. Add a second sheet of filo over it and brush with melted butter. At the bottom edge of the filo closest to you sprinkle 4 tablespoons of filling so it forms a log. Tuck the sides of the filo in slightly and roll from the bottom edge of the filo over the filling. Roll two more times then slice the filo horizontally to separate the roll from the top portion of the filo. Cut the filled filo log into 4 pieces and gently place them on the baking sheet. 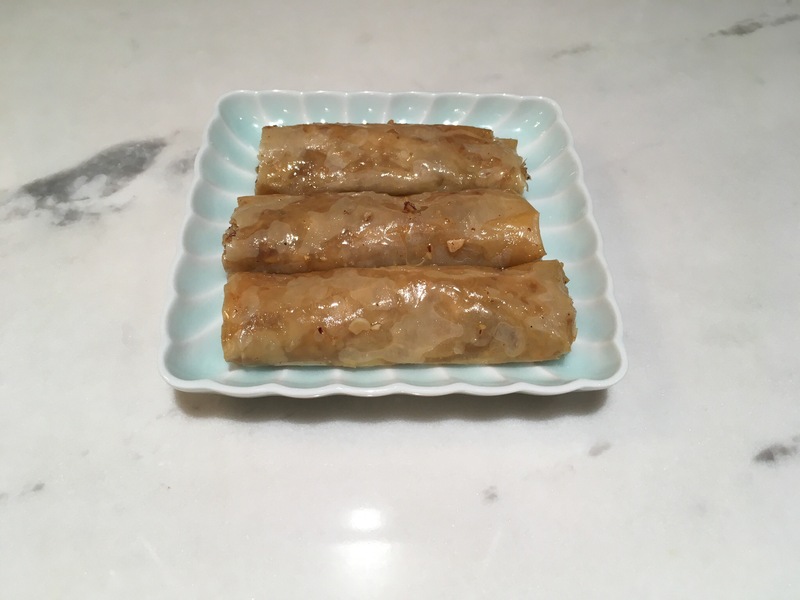 Brush the filled filo logs with melted butter. Repeat the process until you have used up all the filling. Place about 20 baklava rolls per baking sheet. Turn on the burner to medium high heat for the pot with the syrup ingredients and bring to a boil. Stir often. Lower heat slightly and let the syrup simmer briskly for 15-20 minutes until the liquid is thicker and syrupy. Remove from burner. Bake the tray of baklava for 15 minutes until golden. Remove baking sheet from the oven and, using tongs, gently immerse 6 hot baklava logs in the syrup, turning to coat completely. Return them to the baking sheet. Repeat until all logs are coated in syrup, then transfer logs to a rack to cool. Repeat with the other two trays. Store in an airtight container at room temperature for about 1 week. Makes 60 baklava rolls.